Several years ago, BYU biology professor John Kauwe got bumped to first class on a flight and found himself sitting next to former BYU and NBA basketball player Shawn Bradley. Even in first class, Bradley's legs were folded under his seat in an awkward and uncomfortable position. That's because Bradley stands 7 feet 6 inches tall, which puts him in the 99.99999th percentile for height. 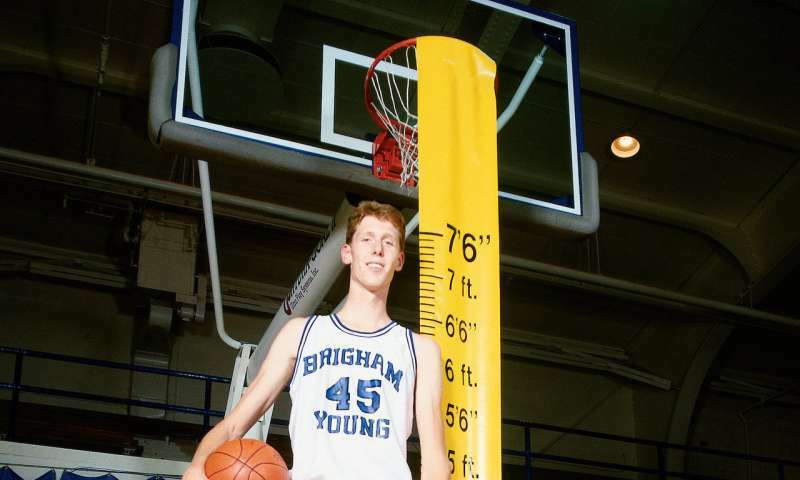 The average height of a male American is 5 feet 10 inches; the average plane seat—even a first-class plane seat—is not built to accommodate someone as tall as Shawn Bradley. The two struck up a conversation, and, on learning Kauwe is a genetic researcher, Bradley said he'd always been curious about his height and DNA. Unlike many extremely tall people who have a rare genetic disorder or a pituitary tumor, Bradley is healthy and still one of the tallest people in recorded history. That combination of factors made mapping the genome of the 12-year NBA veteran an enticing scientific endeavor for Kauwe. "Dr. Kauwe told me if I was game, then when we got home he would get the necessary approvals, collect some samples from me and get to work," Bradley said. "I was game—I was very interested to see what he would find out." Kauwe's team started by sorting through a list of 22,539 height-affecting genetic variants identified by the aptly named GIANT Consortium. (These variants each affect height minimally, on the scale of a millimeter or two.) After removing variants with redundant effects, lead authors—BYU undergrad Corinne Sexton and postdoctoral fellow Mark Ebbert—then made a scoring system to rank height based on the presence of 2,910 genetic variants in an individual. The researchers used the scoring system to build a distribution of height scores using existing genome datasets of 1,020 people. They then sequenced all 3 billion base pairs of Bradley's genome and applied the scoring system to see if it correctly predicted his height score among the population. At the outset, the researchers thought that perhaps rare genetic changes in known height genes would account For Bradley's height. They didn't find any of those. "But when we checked his height score using the GIANT markers, it was off the chart," Kauwe said. Instead of discovering the former basketball player had a few rare genetic traits accounting for his exceptional height, they found his height was a result of him having nearly every common genetic variant that positively affects height. "It appears that if you're really, really tall, you've probably achieved your full genetic potential for height," Kauwe continued. "Shawn Bradley definitely realized the full potential of his DNA." The study found Bradley had 198 more height-associated genetic variants than the average person in the sample. While the genome analysis correctly predicted Bradley's height rank among the sample population (No. 1 and a significant outlier, of course), it couldn't quite accurately predict his actual height. The authors weren't alarmed by this, considering there are several other factors outside of DNA that affect height, such as environment, diet and health, or even a mother's nutrition when a child is in the womb. According to previous studies, the DNA evaluated using this height score only predicts about 50 percent of an adult's height. Researchers suggest the methods used in this research project can be used to analyze other complex traits that have broad impact on human health and quality of life. "It was a pretty incredible occurrence to study," Sexton said. "It really validated a lot of excellent research on height that has been done before." This is why pregame stretching is so important.